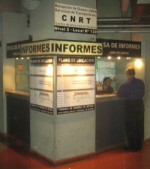 Comisión Nacional de Regulación del Transporte (CNRT), which is the official regulatory authority. You can file complaints at their service points in all major terminals. When you are in a dispute with a bus company, mentioning the magic word CNRT will make them much more cooperative. Safety requirements include regular technical revisions of the buses and also medical tests for the drivers. Misbehavior of the drivers or poor maintenance of the buses should be reported to the CNRT. Regarding passenger rights, the companies are forced to print all relevant information like destination and comfort category onto the tickets and to allow for 15 kg of baggage without surcharge. Note that by law, tickets are personalized and have to include the type and number of your identity document. When a company cancels a booked connection, you get your money back. When it is you who cancels a ticket before departure, you get a refund of 70% or more, depending on how early you give notice. Here you can find a list (in spanish) of your rights and obligations as a passenger. Your duties include careful checking of the ticket details and not smoking in the bus. Claims for missing or damaged baggage have to be anounced within 24 hours after arrival. Bus services in Argentina come in five comfort classes. The characteristics of these classes are legally regulated in order to facilitate a comparison of the services of different bus companies. For example, minimum requirements for the dimensions of the seats and the reclining angle of the backrests are prescribed by law. Of course there still exist significant differences between the companies with respect to seating comfort and general quality of service.